Ministry of Health & Family Welfare is ready to hire the applicants for the 08 available seats of Scientist, Consultant, Programme Coordinator Jobs as per the MOHFW Recruitment 2017 advertisement published on department web portal. Job seekers who have required eligibility may apply through Offline Mode after reading all the details of MOHFW Recruitment 2017 through this section.You are needed to send the application form in the appropriate format at the below address till or before 21st January 2017. Education Needed : Candidates who are willing to apply for MOHFW jobs must posses Post Graduation Degree from any recognized board or institution. The candidates who wish to apply for the available vacancy should be existing between 30 - Years. Reserved category applicants will get the age relaxation as per MOHFW norms. Emoluments given to Employee: Contenders who will be appointed successfully for MOHFW Vacancy, they get the salary pay band of Rs. 1,50,000 - 1,80,000/- (Post 1), 60,000 - 90,000/- (Post 2), Rs. 60,000 - 80,000/- (Post 3), Rs. 60,000 - 70,000/- (Post 4), Rs. 50,000 - 55,000/- (Post 5), Rs. 30,000 - 35,000/- (Post 6), Rs. 40,000 - 50,000/- (Post 7). as per organization norms. Last Date for Receiving Hard Copy of Application Form Is : 21-01-2017. Click Here For MOHFW Official Notification Link. Pune Mahanagar Parivahan Mahamandal Limited is ready to hire the applicants for the 8040 available seats of Driver, Conductor, Cleaner Jobs as per the PMPML Recruitment 2017 advertisement published on department web portal. Job seekers who have required eligibility may apply through Online Mode after reading all the details of PMPML Recruitment 2017 through this section.Candidates who meet the eligibility criteria and interested to apply they can submit their application form before the last date that is 29th January 2017. Education Needed : Candidates who are willing to apply for PMPML jobs must posses 5th / 8th / 10th from any recognized board or institution. Reserved category applicants will get the age relaxation as per PMPML norms. Commencement of Online Application Form Is : 04-01-2017. Closing Date For Apply Online : 29-01-2017. Department of Technical Education and Industrial Training is ready to hire the applicants for the 474 available seats of Instructor, Drawing Master, Education Mistress Jobs as per the DTE Punjab Recruitment 2017 advertisement published on department web portal. Job seekers who have required eligibility may apply through Online Mode after reading all the details of DTE Punjab Recruitment 2017 through this section.Candidates who meet the eligibility criteria and interested to apply they can submit their application form before the last date that is 21st January 2017. Education Needed : Candidates who are willing to apply for DTE Punjab jobs must posses 10th / 12th / Diploma / Graduation Degree from any recognized board or institution. The candidates who wish to apply for the available vacancy should be existing between 18 - 37 Years As On 01-01-2016. Reserved category applicants will get the age relaxation as per DTE Punjab norms. Emoluments given to Employee: Contenders who will be appointed successfully for DTE Punjab Vacancy, they get the salary pay band of Rs. 10,300 - 34,800/- plus 4600/- Grade Pay (Post 1-44), Rs. 10,300 - 34,800/- plus 3600/- Grade Pay (Post 45), Rs. 5,910 - 20,200/- plus 2400/- Grade Pay (Post 46), Rs. 10,300 - 34,800/- plus 4400/- Grade Pay (Post 47), Rs. 10,300 - 34,800/- plus 3200/- Grade Pay (Post 48) as per organization norms. Selection of the job hunters will be done on the basis of their performance in the Written Exam, Skill Test, Interview/ counseling round conducted by the selection committee. Starting Date For Online Application Is : 30-12-2016. Closing Date of Online Submission of Applications Form Is : 21-01-2017. Click Here For DTE Punjab Official Notification Link. Chandigarh City Bus Services Society is ready to hire the applicants for the 02 available seats of Works Manager Jobs as per the CCBSS Recruitment 2017 advertisement published on department web portal. Job seekers who have required eligibility may apply through Online Mode after reading all the details of CCBSS Recruitment 2017 through this section.Candidates who meet the eligibility criteria and interested to apply they can submit their application form before the last date that is 20th January 2017. Education Needed : Candidates who are willing to apply for CCBSS jobs must posses Diploma (Automobile Engineering) / Engineering Degree (Mechanical) from any recognized board or institution. The candidates who wish to apply for the available vacancy should be existing between 25 - 35 Years. Reserved category applicants will get the age relaxation as per CCBSS norms. Emoluments given to Employee: Contenders who will be appointed successfully for CCBSS Vacancy, they get the salary pay band of Rs. 3.75 lakh per annum as per organization norms. Commencement of Online Application Form Is : 28-12-2016. Last Date of Online Application Is : 20-01-2017. Click Here For CCBSS Official Notification Link. Secondary Education Department Uttar Pradesh is ready to hire the applicants for the 9342 available seats of Teacher Jobs as per the Secondary Education Department UP Recruitment 2017 advertisement published on department web portal. Job seekers who have required eligibility may apply through Online Mode after reading all the details of Secondary Education Department UP Recruitment 2017 through this section.Candidates who meet the eligibility criteria and interested to apply they can submit their application form before the last date that is 26th January 2017. Education Needed : Candidates who are willing to apply for Secondary Education Department UP jobs must posses 12th / Graduation Degree / Engineering Degree from any recognized board or institution. The candidates who wish to apply for the available vacancy should be existing between 21 - 40 Years As On 01-07-2016. Reserved category applicants will get the age relaxation as per Secondary Education Department UP norms. Emoluments given to Employee: Contenders who will be appointed successfully for Secondary Education Department UP Vacancy, they get the salary pay band of Rs. 9,300 - 34,800/- plus Grade Pay of Rs. 4600/-. as per organization norms. Starting Date of Online Registration of Application Form Is : 26-12-2016. Online Registration Ends On : 26-01-2017. Click Here For Secondary Education Department UP Official Notification Link. Ordnance Factory Itarsi is ready to hire the applicants for the 02 available seats of Medical Assistant Jobs as per the Ordnance Factory Itarsi Recruitment 2017 advertisement published on department web portal. Job seekers who have required eligibility may apply after reading all the details of Ordnance Factory Itarsi Recruitment 2017 through this section.Candidates who have decided to build their career in this organization they can attend Walkin Interview which are going to be held On 10th January 2017. Education Needed : Candidates who are willing to apply for Ordnance Factory Itarsi jobs must posses 12th from any recognized board or institution. Reserved category applicants will get the age relaxation as per Ordnance Factory Itarsi norms. Emoluments given to Employee: Contenders who will be appointed successfully for Ordnance Factory Itarsi Vacancy, they get the salary pay band of Rs. 19,260/- as per organization norms. Walk In Date : 10-01-2017. Gujarat Gas Limited is ready to hire the applicants for the 02 available seats of Manager Jobs as per the Gujarat Gas Limited Recruitment 2017 advertisement published on department web portal. Job seekers who have required eligibility may apply through Online Mode after reading all the details of Gujarat Gas Limited Recruitment 2017 through this section.Candidates who meet the eligibility criteria and interested to apply they can submit their application form before the last date that is 10th January 2017. Education Needed : Candidates who are willing to apply for Gujarat Gas Limited jobs must posses Engineering Degree / Post Graduation Degree from any recognized board or institution. Reserved category applicants will get the age relaxation as per Gujarat Gas Limited norms. Online Registration Ends On : 10-01-2017. 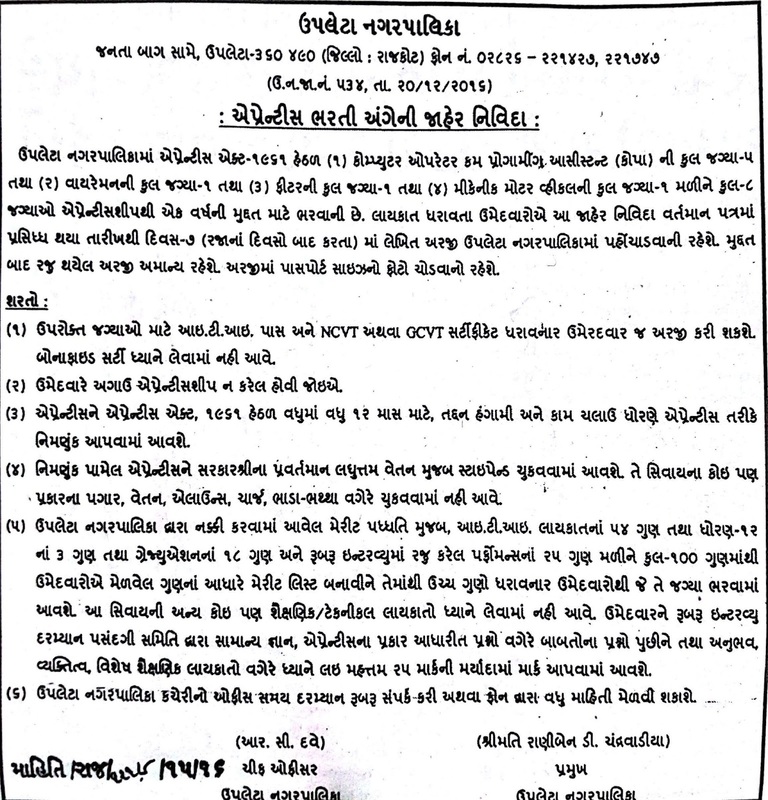 Click Here For Gujarat Gas Limited Official Notification Link. Uttarakhand University of Horticulture & Forestry is ready to hire the applicants for the 04 available seats of Programme Coordinator, Specialist Jobs as per the UUHF Recruitment 2017 advertisement published on department web portal. Job seekers who have required eligibility may apply through Offline Mode after reading all the details of UUHF Recruitment 2017 through this section.You are needed to send the application form in the appropriate format at the below address till or before 12th January 2017. Education Needed : Candidates who are willing to apply for UUHF jobs must posses Doctoral Degree / Post Graduation Degree from any recognized board or institution. Reserved category applicants will get the age relaxation as per UUHF norms. Emoluments given to Employee: Contenders who will be appointed successfully for UUHF Vacancy, they get the salary pay band of Rs. 37,400 - 67,000/- plus 9,000/-, Rs. 15,600 - 39,100 plus 5,400/-Grade Pay as per organization norms. Closing Date for Forwarding Filled Application Forms : 12-01-2017. Click Here For UUHF Official Notification Link. Raj Gramin Pashupalan Vikas Sansthan is ready to hire the applicants for the 9220 available seats of District Manager, Veterinary Assistant, Animal Activist Jobs as per the Raj Gramin Pashupalan Vikas Sansthan Recruitment 2017 advertisement published on department web portal. Job seekers who have required eligibility may apply through Offline Mode after reading all the details of Raj Gramin Pashupalan Vikas Sansthan Recruitment 2017 through this section.You are needed to send the application form in the appropriate format at the below address till or before 5th January 2017. Education Needed : Candidates who are willing to apply for Raj Gramin Pashupalan Vikas Sansthan jobs must posses 10th / 12th / Graduation Degree / Post Graduation Degree from any recognized board or institution. 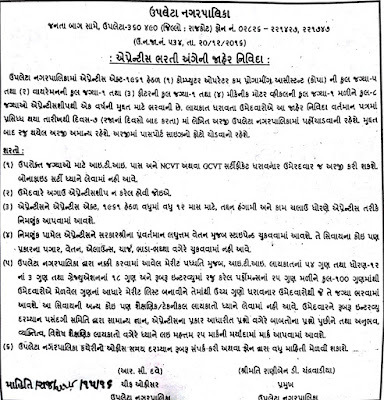 Examination Fee for All Candidates : Rs. 1000/-(Post 1), 800/-(Post 2), 600/-(Post 3). The candidates who wish to apply for the available vacancy should be existing between 21 - 40 Years (Post 1), 18 - 40 Years (Post 2,3). Reserved category applicants will get the age relaxation as per Raj Gramin Pashupalan Vikas Sansthan norms. Emoluments given to Employee: Contenders who will be appointed successfully for Raj Gramin Pashupalan Vikas Sansthan Vacancy, they get the salary pay band of Rs. 15,000/- (Post 1), Rs. 12,000/- (Post 2), Rs. 10,000/- (Post 3). as per organization norms. Deadline to Submit Hard Copy of Application Form Is : 05-01-2017. City Sessions Court Calcutta is ready to hire the applicants for the 13 available seats of Process Server, Peon Jobs as per the City Sessions Court Calcutta Recruitment 2017 advertisement published on department web portal. Job seekers who have required eligibility may apply through Offline Mode after reading all the details of City Sessions Court Calcutta Recruitment 2017 through this section.You are needed to send the application form in the appropriate format at the below address till or before 15th January 2017. Education Needed : Candidates who are willing to apply for City Sessions Court Calcutta jobs must posses 8th from any recognized board or institution. The candidates who wish to apply for the available vacancy should be existing between 18 - 40 Years As On 01-01-2016. Reserved category applicants will get the age relaxation as per City Sessions Court Calcutta norms. Emoluments given to Employee: Contenders who will be appointed successfully for City Sessions Court Calcutta Vacancy, they get the salary pay band of Rs. 54,00 - 25,200/- (Post 1), Rs. 4,900 - 16,200/- (Post 2) plus Grade Pay of Rs. 2300/- (Post 1), Rs. 1700/- (Post 2). as per organization norms. Selection of the job hunters will be done on the basis of their performance in the Written Examination, Personality Test conducted by the selection committee. Last date to submit application form : 15-01-2017. Click Here For City Sessions Court Calcutta Official Notification Link. Rangareddy District Court is ready to hire the applicants for the 91 available seats of Process Server Jobs as per the Rangareddy District Court Recruitment 2017 advertisement published on department web portal. Job seekers who have required eligibility may apply through Offline Mode after reading all the details of Rangareddy District Court Recruitment 2017 through this section.You are needed to send the application form in the appropriate format at the below address till or before 21st January 2017. Education Needed : Candidates who are willing to apply for Rangareddy District Court jobs must posses 7th / ITI from any recognized board or institution. Those aspirants who are belonging to General/ OBC Category & interested to apply for above posts they need to be paid Application/Examination fee of 200/-. Job hunters belonging to SC/ ST/ PWD (Persons with Disability)/ Ex-s Category are exempted from such payment of Application/Examination fee. The candidates who wish to apply for the available vacancy should be existing between 18 - 34 Years As On 01-07-2016. Reserved category applicants will get the age relaxation as per Rangareddy District Court norms. Emoluments given to Employee: Contenders who will be appointed successfully for Rangareddy District Court Vacancy, they get the salary pay band of Rs. 15,460 - 47,330/-. as per organization norms. Selection of the job hunters will be done on the basis of their performance in the Written Exam, Oral Test/Viva Voce in the shape of interview conducted by the selection committee. End Date To Submit Hard Copy of Application Form Is : 21-01-2017. Click Here For Rangareddy District Court Official Notification Link. Sarva Shiksha Abhiyan is ready to hire the applicants for the 22 available seats of Consultants Jobs as per the SSA Recruitment 2017 advertisement published on department web portal. Job seekers who have required eligibility may apply through Online Mode after reading all the details of SSA Recruitment 2017 through this section.Candidates who meet the eligibility criteria and interested to apply they can submit their application form before the last date that is 16th January 2017. Education Needed : Candidates who are willing to apply for SSA jobs must posses Diploma / Engineering Degree / Graduation Degree / Post Graduation Degree from any recognized board or institution. The candidates who wish to apply for the available vacancy should not be more than 65 Years As On 01-01-2017. Emoluments given to Employee: Contenders who will be appointed successfully for SSA Vacancy, they get the salary pay band of Rs. 60,000 - 90,000/- (for Chief Consultant), Rs. 50,000 - 70,000/- (for Sr. Consultant), Rs. 40,000 - 60,000/- (for Consultant) as per organization norms. Selection of the job hunters will be done on the basis of their performance in the Written Exam, Personal Interview, Oral conducted by the selection committee. Last Date To Apply Online Is : 16-01-2017. 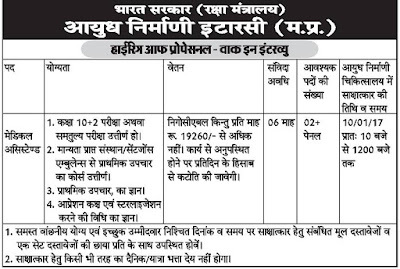 Board of Revenue Uttar Pradesh is ready to hire the applicants for the 2432 available seats of Tehsildar, Driver, Stenographer Jobs as per the Board of Revenue Uttar Pradesh Recruitment 2017 advertisement published on department web portal. Job seekers who have required eligibility may apply through Online Mode after reading all the details of Board of Revenue Uttar Pradesh Recruitment 2017 through this section.Candidates who meet the eligibility criteria and interested to apply they can submit their application form before the last date that is As Soon As Possible. Education Needed : Candidates who are willing to apply for Board of Revenue Uttar Pradesh jobs must posses 12th / Diploma / Graduation Degree from any recognized board or institution. Reserved category applicants will get the age relaxation as per Board of Revenue Uttar Pradesh norms. Emoluments given to Employee: Contenders who will be appointed successfully for Board of Revenue Uttar Pradesh Vacancy, they get the salary pay band of Rs. 15,600 - 39,100/- plus 6600/- (Post 5) 5400/-(Post 1,6) Grade Pay, Rs. 5,200 - 20,200/- plus 2800/- Grade Pay (Post 3,4) as per organization norms. Last Date of Online Application Is : As Soon As Possible. Chief District Medical Officer Boudh is ready to hire the applicants for the 31 available seats of Pharmacist, Radiographer, Attendant Jobs as per the CDMO Boudh Recruitment 2017 advertisement published on department web portal. Job seekers who have required eligibility may apply through Offline Mode after reading all the details of CDMO Boudh Recruitment 2017 through this section.You are needed to send the application form in the appropriate format at the below address till or before 9th January 2017. Education Needed : Candidates who are willing to apply for CDMO Boudh jobs must posses 7th / 12th / Diploma from any recognized board or institution. The candidates who wish to apply for the available vacancy should be existing between 18 - 32 Years (Post 1-3), 21 - 32 Years (Post 4). Reserved category applicants will get the age relaxation as per CDMO Boudh norms. Emoluments given to Employee: Contenders who will be appointed successfully for CDMO Boudh Vacancy, they get the salary pay band of Rs. 7600/- (Post 1-3), Rs. 6450/- (Post 4). as per organization norms. Selection of the job hunters will be done on the basis of their performance in the Carrier Assessment conducted by the selection committee. Application Has To Be Sent Latest By : 09-01-2017. Click Here For CDMO Boudh Official Notification Link. Women & Child Development Department Odisha is ready to hire the applicants for the 102 available seats of DCPU, OSCPS & SARA Jobs as per the Women & Child Development Department Odisha Recruitment 2017 advertisement published on department web portal. Job seekers who have required eligibility may apply through Offline Mode after reading all the details of Women & Child Development Department Odisha Recruitment 2017 through this section.You are needed to send the application form in the appropriate format at the below address till or before 21st January 2017. Education Needed : Candidates who are willing to apply for Women & Child Development Department Odisha jobs must posses Graduation Degree / Post Graduation Degree from any recognized board or institution. The candidates who wish to apply for the available vacancy should be existing between 21 - 35 Years As On 01-01-2016. Reserved category applicants will get the age relaxation as per Women & Child Development Department Odisha norms. Emoluments given to Employee: Contenders who will be appointed successfully for Women & Child Development Department Odisha Vacancy, they get the salary pay band of (DCPU Posts) Rs. 33,250/- (Post 1), Rs. 21,000/- (Post 2-4), Rs. 14,000/- (Post 5-6), Rs. 8,000/- (Post 7). (OSCPS & SARA) Rs. 35,000/- (Post 1-2), Rs. 26,250/- (Post 3), Rs. 17,500 (Post 4), Rs. 10,000 (Post 5). as per organization norms. Selection of the job hunters will be done on the basis of their performance in the Written Exam, Personal Interview, Viva-Voce Test conducted by the selection committee. Deadline to Submit Hard Copy of Application Form Is : 21-01-2017. Click Here For Women & Child Development Department Odisha Official Notification Link. University of Agricultural Sciences Dharwad is ready to hire the applicants for the 01 available seats of Computer Assistant Jobs as per the UAS Dharwad Recruitment 2017 advertisement published on department web portal. Job seekers who have required eligibility may apply after reading all the details of UAS Dharwad Recruitment 2017 through this section.Candidates who have decided to build their career in this organization they can attend Walkin Interview which are going to be held On 2nd January 2017. Education Needed : Candidates who are willing to apply for UAS Dharwad jobs must posses Graduation Degree from any recognized board or institution. Reserved category applicants will get the age relaxation as per UAS Dharwad norms. Emoluments given to Employee: Contenders who will be appointed successfully for UAS Dharwad Vacancy, they get the salary pay band of Rs. 20,000/-. as per organization norms. Walk In Date : 02-01-2017. Click Here For UAS Dharwad Official Notification Link. Safdarjung Hospital is ready to hire the applicants for the 01 available seats of Sports Psychologist Jobs as per the Safdarjung Hospital Recruitment 2017 advertisement published on department web portal. Job seekers who have required eligibility may apply after reading all the details of Safdarjung Hospital Recruitment 2017 through this section.Candidates who have decided to build their career in this organization they can attend Walkin Interview which are going to be held On 12th January 2017. Education Needed : Candidates who are willing to apply for Safdarjung Hospital jobs must posses Post Graduation Degree from any recognized board or institution. Reserved category applicants will get the age relaxation as per Safdarjung Hospital norms. Emoluments given to Employee: Contenders who will be appointed successfully for Safdarjung Hospital Vacancy, they get the salary pay band of Rs. 55,000/- as per organization norms. Last Date to Attend Interview : 12-01-2017. Click Here For Safdarjung Hospital Official Notification Link. 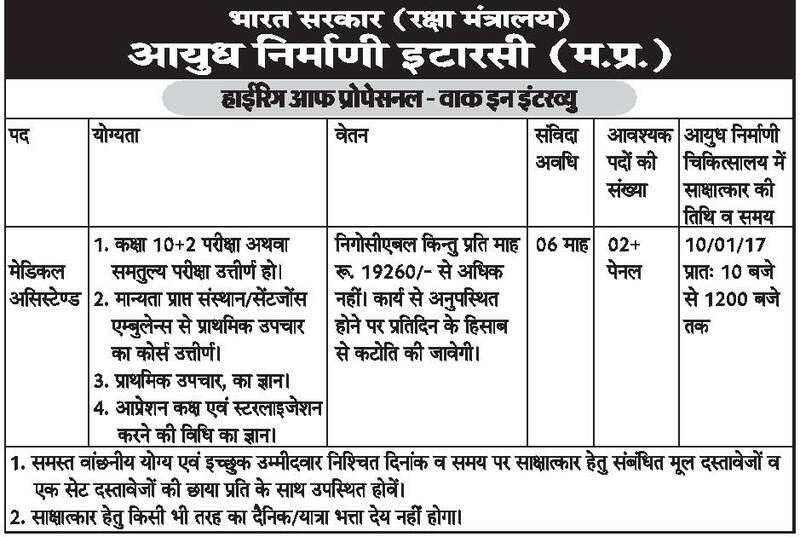 Department of Animal Husbandry Uttarakhand is ready to hire the applicants for the 116 available seats of Veterinary Pharmacist Jobs as per the AHD UK Recruitment 2017 advertisement published on department web portal. Job seekers who have required eligibility may apply through Offline Mode after reading all the details of AHD UK Recruitment 2017 through this section.You are needed to send the application form in the appropriate format at the below address till or before 23rd January 2017. Education Needed : Candidates who are willing to apply for AHD UK jobs must posses 12th / Diploma from any recognized board or institution. The candidates who wish to apply for the available vacancy should be existing between 18 - 42 Years As on 01-07-2016. Reserved category applicants will get the age relaxation as per AHD UK norms. Emoluments given to Employee: Contenders who will be appointed successfully for AHD UK Vacancy, they get the salary pay band of Rs. 9,300 - 34,800/- plus 4200/- Grade Pay as per organization norms. Closing Date to Submit Hard Copy of Application Form Is : 23-01-2017. Click Here For AHD UK Official Notification Link. Upleta Nagarpalika is ready to hire the applicants for the 05 available seats of Apprentice Jobs as per the Upleta Nagarpalika Recruitment 2017 advertisement published on department web portal. Job seekers who have required eligibility may apply through Offline Mode after reading all the details of Upleta Nagarpalika Recruitment 2017 through this section.You are needed to send the application form in the appropriate format at the below address till or before 29th December 2016. Education Needed : Candidates who are willing to apply for Upleta Nagarpalika jobs must posses ITI from any recognized board or institution. Reserved category applicants will get the age relaxation as per Upleta Nagarpalika norms. The Last date For Acceptance of Application Forms : 29-12-2016. South Eastern Coalfields Limited is ready to hire the applicants for the Various available seats of Mining Sirdar Jobs as per the SECL Recruitment 2017 advertisement published on department web portal. Job seekers who have required eligibility may apply through Offline Mode after reading all the details of SECL Recruitment 2017 through this section.You are needed to send the application form in the appropriate format at the below address till or before 26th December 2016. Education Needed : Candidates who are willing to apply for SECL jobs must posses ITI / Diploma from any recognized board or institution. Reserved category applicants will get the age relaxation as per SECL norms. Emoluments given to Employee: Contenders who will be appointed successfully for SECL Vacancy, they get the salary pay band of Rs. 19035.02/- as per organization norms. Deadline to Submit Hard Copy of Application Form Is (Reasoning Level) : 26-12-2016. Deadline to Submit Hard Copy of Application Form Is (Main Office Bilaspur) : 11-01-2017. Click Here For SECL Official Notification Link. Veermata Jijabai Technological Institute is ready to hire the applicants for the 06 available seats of Engineer, Plumber, Electrician Jobs as per the VJTI Recruitment 2017 advertisement published on department web portal. Job seekers who have required eligibility may apply after reading all the details of VJTI Recruitment 2017 through this section.Candidates who have decided to build their career in this organization they can attend Walkin Interview which are going to be held On 4th January 2017. Education Needed : Candidates who are willing to apply for VJTI jobs must posses 8th / 10th / ITI / Diploma / Engineering Degree (Civil) from any recognized board or institution. Reserved category applicants will get the age relaxation as per VJTI norms. Emoluments given to Employee: Contenders who will be appointed successfully for VJTI Vacancy, they get the salary pay band of Rs. 25,000/- (Post 1), Rs. 18,000/- (Post 2-4), Rs. 10,000/- (Post 5) as per organization norms. Date of Interview : 04-01-2017. Click Here For VJTI Official Notification Link. Tamilnadu Rural Development and Panchayat Raj Department is ready to hire the applicants for the 09 available seats of Driver, Office Assistant Jobs as per the TNRD Recruitment 2017 advertisement published on department web portal. Job seekers who have required eligibility may apply through Offline Mode after reading all the details of TNRD Recruitment 2017 through this section.You are needed to send the application form in the appropriate format at the below address till or before 4th January 2017. Education Needed : Candidates who are willing to apply for TNRD jobs must posses 8th / 10th from any recognized board or institution. The candidates who wish to apply for the available vacancy should be existing between (OC Candidates - 18 - 30 Years), (BC, MBC, DC Candidates - 18 - 32 Years), (SC, SCA, ST Candidates - 18 - 35 Years). Reserved category applicants will get the age relaxation as per TNRD norms. Emoluments given to Employee: Contenders who will be appointed successfully for TNRD Vacancy, they get the salary pay band of Rs. 5,200 - 20,200/- (Post 1), Rs. 4,800 - 10,000/- (Post 2) plus Grade Pay of Rs. 2400/- (Post 1), Rs. 1300/- (Post 2) as per organization norms. Selection of the job hunters will be done on the basis of their performance in the Short Listing, Skill Test conducted by the selection committee. Deadline to Submit the Application Is : 04-01-2017. Click Here For TNRD Official Notification Link 1. Click Here For TNRD Official Notification Link 2. Fisheries Department Maharashtra is ready to hire the applicants for the 50 available seats of Clerk, Statistical Assistant, Mechanical Director Jobs as per the Fisheries Department Maharashtra Recruitment 2017 advertisement published on department web portal. Job seekers who have required eligibility may apply through Online Mode after reading all the details of Fisheries Department Maharashtra Recruitment 2017 through this section.Candidates who meet the eligibility criteria and interested to apply they can submit their application form before the last date that is 14th January 2017. Education Needed : Candidates who are willing to apply for Fisheries Department Maharashtra jobs must posses 10th / ITI / Graduation Degree from any recognized board or institution. The candidates who wish to apply for the available vacancy should be existing between 18 - 38 Years As On 01-12-2016. Reserved category applicants will get the age relaxation as per Fisheries Department Maharashtra norms. Emoluments given to Employee: Contenders who will be appointed successfully for Fisheries Department Maharashtra Vacancy, they get the salary pay band of Rs. 9,300 - 34,800/- plus 4200/- Grade Pay (Post 1,2), Rs. 5,200 - 20,200/- plus 1900/2400/- Grade Pay (Post 3,4) as per organization norms. Online Registration of Application Form Is Starts From : 24-12-2016. Online Registration of Application Form Ends On : 14-01-2017. Click Here For Fisheries Department Maharashtra Official Notification Link. Zilla Swasthya Samiti Nayagarh is ready to hire the applicants for the 06 available seats of Laboratory Technician Jobs as per the Zilla Swasthya Samiti Nayagarh Recruitment 2017 advertisement published on department web portal. Job seekers who have required eligibility may apply through Offline Mode after reading all the details of Zilla Swasthya Samiti Nayagarh Recruitment 2017 through this section.You are needed to send the application form in the appropriate format at the below address till or before 14th January 2017. Education Needed : Candidates who are willing to apply for Zilla Swasthya Samiti Nayagarh jobs must posses 12th / Diploma from any recognized board or institution. The candidates who wish to apply for the available vacancy should be existing between 21 - 32 Years As On 01-01-2017. Reserved category applicants will get the age relaxation as per Zilla Swasthya Samiti Nayagarh norms. Emoluments given to Employee: Contenders who will be appointed successfully for Zilla Swasthya Samiti Nayagarh Vacancy, they get the salary pay band of Rs. 9,820/- as per organization norms. Selection of the job hunters will be done on the basis of their performance in the Career Assessment conducted by the selection committee. Last Date to Submit Hard Copy of Application Form Is : 14-01-2017. Click Here For Zilla Swasthya Samiti Nayagarh Official Notification Link. Department Of Industries and Commerce Tamil Nadu is ready to hire the applicants for the 01 available seats of Telephone Operator Jobs as per the Dept of Industries & Commerce TN Recruitment 2017 advertisement published on department web portal. Job seekers who have required eligibility may apply through Offline Mode after reading all the details of Dept of Industries & Commerce TN Recruitment 2017 through this section.You are needed to send the application form in the appropriate format at the below address till or before 20th January 2017. Education Needed : Candidates who are willing to apply for Dept of Industries & Commerce TN jobs must posses 10th from any recognized board or institution. The candidates who wish to apply for the available vacancy should not be more than 30 Years As On 01-07-2016. Reserved category applicants will get the age relaxation as per Dept of Industries & Commerce TN norms. Emoluments given to Employee: Contenders who will be appointed successfully for Dept of Industries & Commerce TN Vacancy, they get the salary pay band of Rs. 5,200 - 20,200/- plus Grade Pay of Rs. 2400/-. as per organization norms. Last Date for the Submission of Application : 20-01-2017. Click Here For Dept of Industries & Commerce TN Official Notification Link.